After Santa Cruz: It's Irish, not Gaelic. Recently, Saoirse Rohan taught Stephen Colbert how to pronounce a few Irish names. He does what most English-speakers do, and make fun of all the "extra" letters that are needed to say simple sounds. As I have heard more Irish spoken, I am beginning to hear sounds indicated by "silent letters" that were silent only in my English-speaking ears. Irish is one of the oldest languages in Europe, arriving to the island around 2500 years ago. That's Bronze Age, before the Romans, between Sappho and Socrates. Irish culture flourished perfectly well without a written language, but when the new technology of the Roman writing system arrived around 400 CE, Irish people—as smart and enterprising then as they are now— adapted that alphabet to record their own language. The spelling rules reflect the sounds they use, and the rules are quite regular. Irish adapted the alphabet to fit their language; letters function differently from Latin and German languages. Irish consonants have two pronunciations, and vowels indicate those differences. If you can't hear the difference between a broad and a slender "b," listen harder. There are also two-consonant combinations that have their own sounds; just like "p-h" in English is pronounced with the "fuh" sound, "b-h" is pronounced "vuh." Irish also uses a mark called a fada to indicate particular vowel sounds, just like in French. Here are more details since I may have gotten that wrong. When I'm reading something by an Irish writer, I use forvo.com, so I can hear pronounced the Irish words. For instance, if you want to know how to pronounce St. Gobnait, listen here. It's a language that carries thousands of years of human life in it, and that it survives at all is a miracle. Here's a short movie with Irish speakers answering the question, "Is Irish Language Important?" This next video on the history of Irish includes interviews adults from other countries who visit Ireland to learn to speak Irish. As emphasized in those videos, languages preserve a manner of thinking. The world can't afford to lose the Irish manner of thinking. 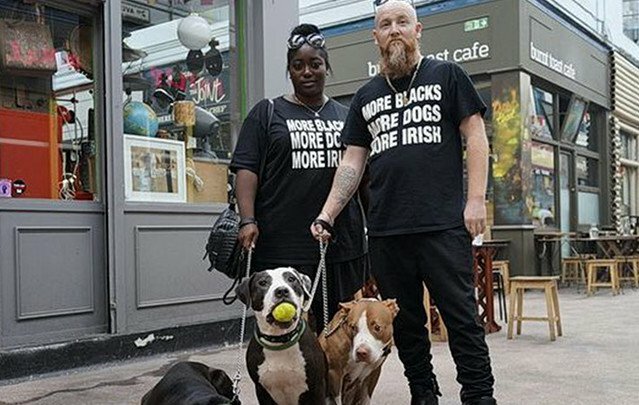 More Blacks, More Dogs, More Irish. Finally, please spend the next ten minutes watching what some say is the best short Irish-language film. So far.